There are very few churches dedicated to St James the Less. His Feast day is May 3rd, which he shares with St. Philip. 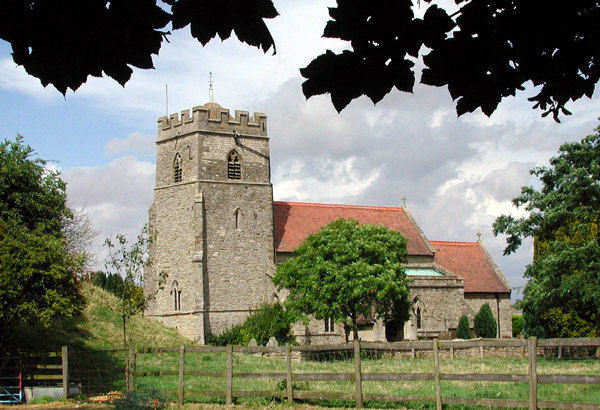 Sulgrave Church was built between 1327 and 1377 during the reign of Edward III. The stone carvings high on the walls of the Chancel commemorate this fact. Edward looks across from the south side at his wife – Queen Phillipa on the north. South Porch. 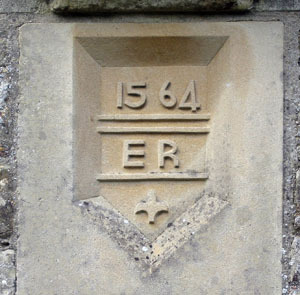 Above the entrance is a stone, renewed in 1979, showing the initials E.R. (Elizabeth Regina) and the date 1564. The Queen was in Northampton that year, and it is possible that the porch was built to celebrate her visit, which may have included Sulgrave. 1564 was also the year in which Amee, the wife of Lawrence Washington died, so it is possible that the porch was built in her memory. This Tudor porch is very interesting. The fleur-de-lys being a reminder of the link which existed between the Thrones of England and France. In the Spandrels of the arch are two circular figures which may have been taken to be the Tudor rose – although this usually has five petals. Beside these are the letters J.H.S. and X.R.S. to the left and right respectively. These are the Greek letters for “Jesus” and “Christ”, and it is extremely rare to find them on a church porch. On the sides of the entrance are carved I and R also very difficult to see – which may stand for “Jesus Rex”. The other doors are also of interest. 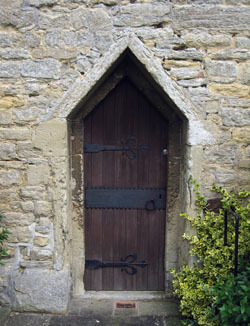 The West or “Tower door” is Saxon and could date from the 10th Century. The North Porch and door date from the 14th Century and are beautiful examples. The window embrasure is very old and is made from the lid of an ancient stone coffin. 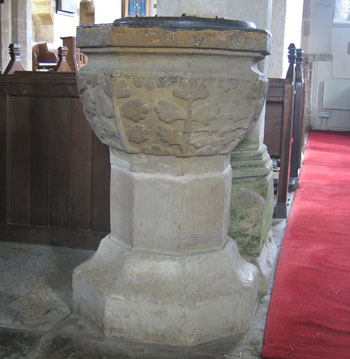 The octagonal font of local stone with lead lining and a deeply incised design of oak leaves dates from the 15th Century. The large oak chest is very old. Local tradition says it belonged to the Washington family. If so it may well have belonged to the Monastery which Lawrence Washington bought from Henry VIII in 1539. 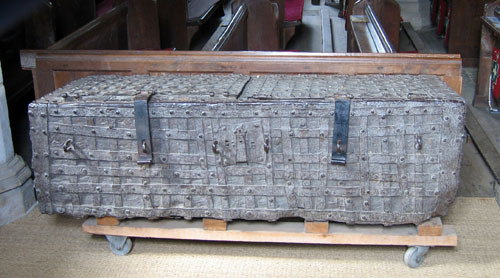 The chest would have been used for the safe keeping of the church valuables. It was also used by the “Culworth Gang” to hold their loot – when William Abbott was Church Warden and also a highwayman! In 1885 it was used for storing coal. Now it holds hymn books and sheet music. 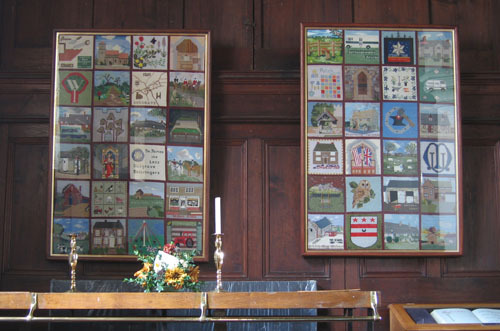 Near the hand-drawn hearse are the tapestries embroidered by the women of Sulgrave, and close by, a case which holds the Book of Remembrance. On the South side of the Chancel is a small perpendicular window dating form the reign of Edward III. Beneath this window is the Low-side door. Doors like this are very rare, and were used before the reformation for the ringing of the bell to announce the Elevation of the Host at Mass. Near this door is a “Squint” or “Hagioscope”, which was blocked up in the post-reformation days, and only restored in 1885. 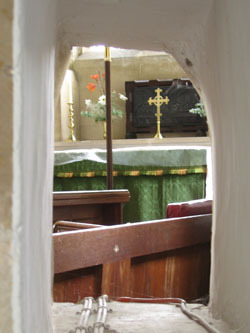 In the early church an altar stood in the South Aisle. Originally the hagioscope enabled the priest at the altar in the South Aisle to see the High Altar. 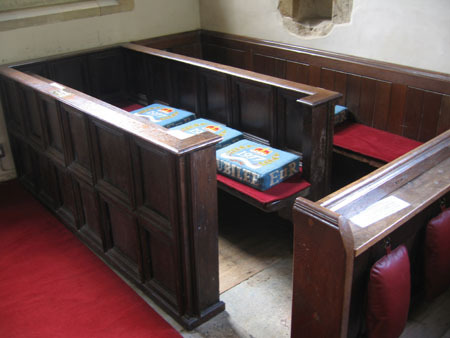 Later, when the Washington Pew replaced the South Aisle Altar, it enabled the occupants of the pew to see the High Altar. The Medieval Piscina, used for the cleansing of the vessels at Mass can still be seen. Its bowl was probably broken off at the time of the Reformation. 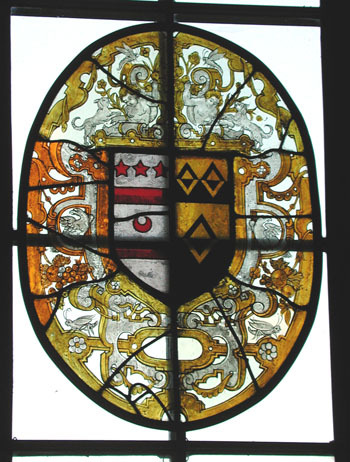 In the window above the Washington Pew are four panels of Elizabethan glass, depicting the Coat of Arms of the three generations of the Washington family. The lower right-hand side are those of Lawrence Washington and his wife Amee Pargiter. To their left are those of his parents John Washington and his wife Margaret Kitson, and above those of their eldest son Robert and his wife Elizabeth Light. All show the mullets and bars, which inspired the Stars and Stripes of the United States of America. In front of the pew, under a large slab of Hornton stone, Lawrence Washington, his wife and their eldest son Robert are buried. Amee died in 1564 and memorial brasses were made for her and her husband. Spaces were left for the dates of Lawrence’s death. He outlived her by twenty-one years, but the spaces were never filled in and remain blank to this day. These brasses have been badly defaced and are now covered with a carpet. Replicas can be seen at Sulgrave Manor. 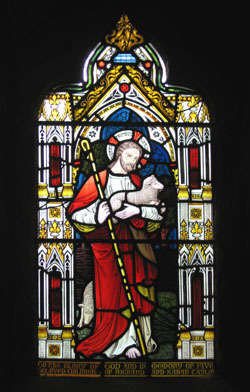 To mark the ‘Third Millenium’ a stained glass window was placed in the South Aisle. 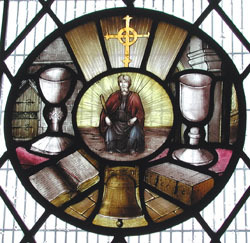 The top left roundel depicts the figure of St. James the Less surrounded by important articles inside the church. 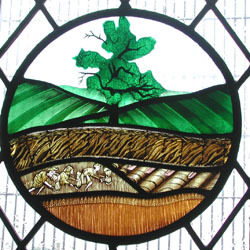 The roundel below shows aspects reflecting the rural background of the church. 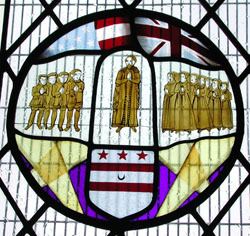 The top right roundel portrays the link between Sulgrave and the United States. The one below shows important landmarks around Sulgrave. The window was dedicated in 2001. 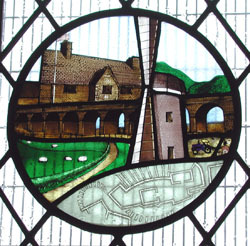 See here for full details of the Roundels. At the back of the church is the little “Jesus window”, given in memory of five children who died of scarlet fever over five hundred years ago. The Tower is the oldest part of the church. It holds six inscribed bells and also a small Medieval Sanctus bell. 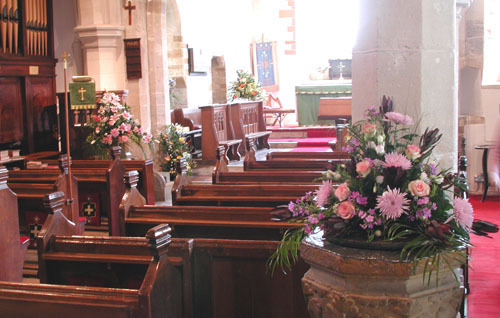 The bells are rung regularly for services and special occasions. In 1992 the church was renovated. New lighting and heating systems were installed and running water was brought into the church. The glass screen in the front of the bell chamber was inspired and designed by William Roberts, who was Master of the Bells at the time. The lantern in the porch, the book case, hymn boards and vestment cabinet were all donated, and the Processional Cross commemorating the Restoration Appeal was dedicated at the Easter Service in 1993. "The Parish Church" - A Chapter from "The Chronicles of a Country Parish" - a village appraisal of Sulgrave published in 1995, to be included in this website later in the year. "The Church War Memorial" - Details of those from Sulgrave who lost their lives in two world wars. Floral decorations from 1972 - Photographs of floral decorations illustrating biblical quotations set out in illuminated texts.